On January 19th Sierra Middle School in Bakersfield California celebrated the official opening of their 20 kilowatt solar array. 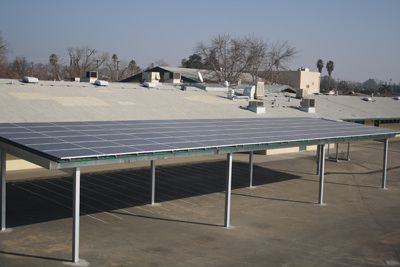 The array was made possible with a grant of $156,000 from the Pacific Gas and Electric Company Foundation, which sponsors the California Solar Schools Program. Sierra MS and itâ€™s club the Kids for Solar Energy, has been part of the PG&E Solar Schools Program for the past eight years and was awarded the title of Model Solar School and the 20kw array was part of the award. The advisors of the KSE Club are Allison Arnold and Bob Hodash, who have received several grants and have worked together over the past eight years, expanding the after-school club, and its outreach efforts. A sunny warm day greeted 30 members of the community of Bakersfield, including the Mayor, Harvey Hall, Kern County Supervisor Karen Goh, the BCSD Superintendent Dr. Robert Arias, Shawn Cooper, SeniorDirector of Corporate Affairs for the Pacific Gas and Electric Company, as well as many others, and more than 225 students from Sierra. Speeches were delivered, students demonstrated their skills at converting Solar Energy, and all four local television news shows, two newspapers, and even a radio station, had crews on hand to cover the event. 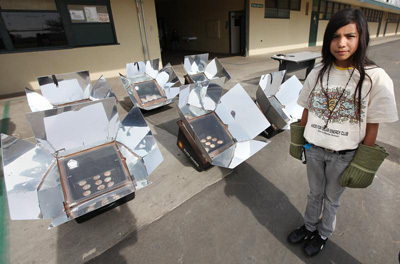 The Kids for Solar Energy Club was formed in 2005 at Sierra Middle School for students in grades 6th to 8th. The Club explores ways to use solar power to reduce greenhouse gasses and climate change. 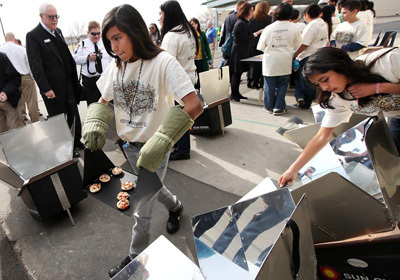 The students have used solar energy to cook foods such as: bread, pizza, chicken, and cookies. The KSE members have learned how to convert solar radiation into electricity to power model cars, fans, and lights. Additionally, the Club has explored electric energy consumption by monitoring the amount of electricity appliances consume and making recommendations on using power strips or unplugging unused appliances. The KSE Club has been very active in the promotion of solar energy and green projects over the last eight years. We have presented at a number of local schools, Earth Day festivals, the Green Expo, Celebrate CSUB, as well as other events. Through our efforts we have educated our students and the public about the importance of saving energy, recycling, and the benefits of renewable technologies. Another club, which includes many of the same members, Sierraâ€™s Green Team, promotes recycling and has a vow to find a way to recycle most everything. Through this clubs efforts recycling at the school has become a way of life and has spread to many other schools. Over the past two years almost 75 thousand pounds of materials have been recycled. Enough to fill three large classrooms! Items such as batteries, paper, cardboard, cell phone, chip bags, worn out markers, etc. would have been sent to landfills are now being recycled and have raised some serious money for the student body fund. Yes, there are companies that will actually pay you for your used chip bags and other items! Last year Bob Hodash was awarded the Solar Schools Inspirational Teacher Award, which was presented on the field of the AT&T Park in San Francisco, before a SF Giants baseball game. The award was presented by Leah Casey Program Manager for the PG&E Solar Schools Program and joining them on the field were 25 student members of the KSE Club and Allison Arnold, several other Teachers from Sierra and a BCSD school board member. This entry was posted on Friday, February 10th, 2012 at 11:05 am and is filed under California . You can follow any responses to this entry through the RSS 2.0 feed. You can leave a response, or trackback from your own site.